If the Republic of Turkmenistan draws a blank you’re not alone. Geography of the former Soviet Union and Central Asia lean toward murky guesses at best. If it helps Turkmenistan is bordered by Kazakhstan to the northwest, Uzbekistan to the north and east, Afghanistan to the southeast, Iran to the south and southwest, the Caspian Sea to the west. Annexed by the Russian Empire in 1881, named Turkmen Soviet Socialist Republic in 1925, Turkmenistan gained independence in 1991 upon dissolution of the Soviet Union. Today, with a population of barely 6 million, Turkmenistan is one of the most sparsely populated places in Asia. In 1971 Russian geologists thought they’d found a substantial oil field near the village of Derweze, Turkmenistan (commonly know as Darvaza) Engineers quickly moved in, made camp and started drilling to assess oil reserves. What they found was a massive natural gas pocket, the ground collapsed swallowing drill rigs and the work camp. Worried lethal methane gas could poison nearby residents, authorities set the pit ablaze. They thought it would burn itself out in a few weeks. Over 50 years later, fire rages on. 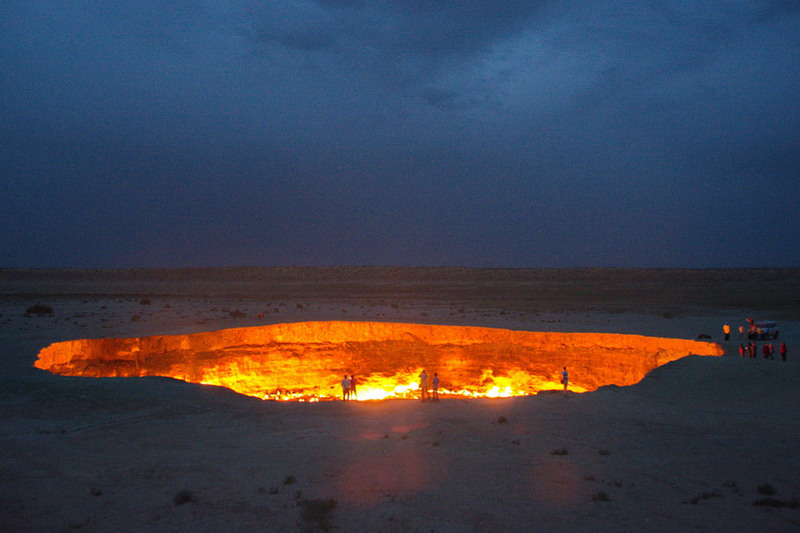 Known today as the gate or portal to Hell, virtually all tourism in Turkmenistan is attributed to viewing the Darvaza Crater. No one knows how long it will burn, but geologists suggest it’s one of the largest natural gas reservoirs in the world. Ponder the words of New York Times contributor David Leonhardt …. “The presidential oath of office contains 35 words and one core promise: to “preserve, protect and defend the Constitution of the United States.” Since virtually the moment Donald J. Trump took that oath two years ago, he has been violating it. He has repeatedly put his own interests above those of the country. He has used the presidency to promote his businesses. He has accepted financial gifts from foreign countries. He has lied to the American people about his relationship with a hostile foreign government. He has tolerated cabinet officials who use their position to enrich themselves. To shield himself from accountability for all of this — and for his unscrupulous presidential campaign — he has set out to undermine the American system of checks and balances. He has called for the prosecution of his political enemies and the protection of his allies. He has attempted to obstruct justice. He has tried to shake the public’s confidence in one democratic institution after another, including the press, federal law enforcement and the federal judiciary. The unrelenting chaos that Trump creates can sometimes obscure the big picture. But the big picture is simple: The United States has never had a president as demonstrably unfit for the office as Trump. And it’s becoming clear that 2019 is likely to be dominated by a single question: What are we going to do about it? The easy answer is to wait — to allow the various investigations of Trump to run their course and ask voters to deliver a verdict in 2020. That answer has one great advantage. It would avoid the national trauma of overturning an election result. Ultimately, however, waiting is too dangerous. The cost of removing a president from office is smaller than the cost of allowing this president to remain. He has already shown, repeatedly, that he will hurt the country in order to help himself. He will damage American interests around the world and damage vital parts of our constitutional system at home. The risks that he will cause much more harm are growing. Some of the biggest moderating influences have recently left the administration. The defense secretary who defended our alliances with NATO and South Korea is gone. So is the attorney general who refused to let Trump subvert a federal investigation into himself. The administration is increasingly filled with lackeys and enablers. Trump has become freer to turn his whims into policy — like, say, shutting down the government on the advice of Fox News hosts or pulling troops from Syria on the advice of a Turkish autocrat. The biggest risk may be that an external emergency — a war, a terrorist attack, a financial crisis, an immense natural disaster — will arise. By then, it will be too late to pretend that he is anything other than manifestly unfit to lead. Despite several attempts to reach you, previous requests to watch a clip from The Newsroom remain unanswered. Understandably there’s a lot on your mind. I know how difficult it is to pull yourselves away from Trump tweets, partisan jibber-jabber, criminal investigations and threat of government shut down if your leader doesn’t get his wall. That said, surely you can spare six minutes to watch this video. If America matters to you, watch to remember what you once cared about…..
My opponent Denver Riggleman, running mate of Corey Stewart, was caught on camera campaigning with a white supremacist. Now he has been exposed as a devotee of Bigfoot erotica. This is not what we need on Capitol Hill. “I thought it was funny. There is no way that anybody’s dumb enough to think this is real,” said Riggleman, a former Air Force intelligence officer and defense contractor who owns a Nelson County distillery with his wife. “These are good people, they’re smart, they’re intelligent, and they want Bigfoot to be with them. And I think that’s a noble pursuit,” Riggleman says in the video. From my opponent Denver Riggleman’s Bigfoot erotica collection. America has a lot more to worry about than Donald Trump.